I was talking to one of my friend Ninaada, who was facing a strange issue while installing Visual Studio 2010. It sounded a little wierd for me, as he said that, most of the applications in the Visual Studio Suite did not respond after the upgrade. Do have a look at this and let us know your suggestions in the comment box! “Visual Studio 2010 has been released recently and I downloaded the iso image of the Ultimate edition DVD from my MSDN account. Eager to try it, I installed it by removing the Release Candidate of the same, which I had installed earlier. The RC was removed without any issues whatsoever. But after installing VS 2010, strangely, Visual Studio 2008 Pro started showing weird problems. At first, the designer view for ASP.Net project stopped working, it would just stop responding. I could not click anywhere in the window & had to close the IDE using the Task Manager. Since I was not much into ASP.Net, and design view was working fine in VS 2010. This error was due to the fact that some .dll file required for rendering was replaced by VS 2010 installer with a newer version of the same dll & which was not compatible with VS 2008. Since it was fine in VS 2010, I did not bother much about it. But situation started worsening after a few days. I had installed XNA Game studio which is an add-on to VS 2008 to create games in C#. VS 2008 not only stopped opening/creating the XNA projects, but also started to fail to open any C# project! I searched over the Internet to see whether anybody else had encountered the same problem. I did not get any such cases, and hence I decided to re-install both VS 2008 & VS 2010. I first removed VS 2010 and started removing the other components it had installed with it. I could remove almost all of them except for one or two. I had to remove the remaining components using the MS Installer Clean-up Utility which is available for download here. It appeared that I had successfully removed VS 2010. Then I re-installed VS 2008 which went well without any issue. Then came the bigger problem. I tried Installing VS 2010 back again, which used to fail repeatedly. It was trying to install VC++ 10.0 Runtime without any success. VC++ Runtime is a prerequisite for installing VS 2010. I tried installing it separately by downloading from the MS website, which would actually install, but would not be detected as installed by VS 2010 Installer, which tried to install it again & would fail. Then I looked into the installation log of VS 2010 which was in my “Temp” folder located in C:\Users\Username\AppData\Local\Temp\ . There, I found that the installer was returning error code 1603, which meant “fatal error during installation”. I digged further and I got error code 1402, which meant that a particular Registry Key was not accessible to the installer. The error message in the log file read something like Error 1402. Could not open key: UNKNOWN\Components\06A0D925C8932A8379FE28AFAF97A860\B45568A682984E035AC37D33679831D4. Verify that you have sufficient access to that key, or contact your support personnel. So, I came to know that the installer has some problems accessing a particular key in the registry. I searched in the net & got a link on how to solve such type of registry inaccessible problems. 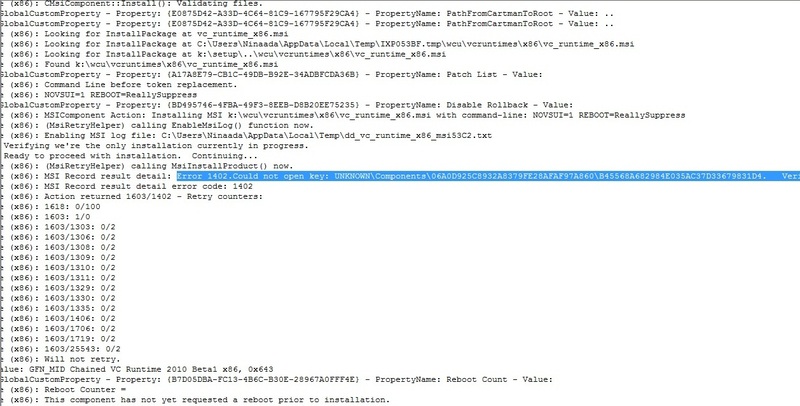 As you can see, that particular Registry key had been “Orphaned”. What happened here was that when VS 2010 was uninstalled, the uninstaller instead of removing those registry keys, had actually, Orphaned them. In the sense, that those Keys don’t belong to any particular user, & hence when the setup tries to create the key, it encounters another key with the same name & cannot modify the existing one since it doesn’t have any owner, rendering it inaccessible to any user/process. As indicated in this earlier link, I changed the permissions for that key & thought Installation would be successful this time. But, this time, another key problem came up! Again I changed the permissions. Posted in Microsoft, Windows Installer, Application Compatibility and Deployments and tagged registry, Visual Studio, vs2010. Bookmark the permalink.